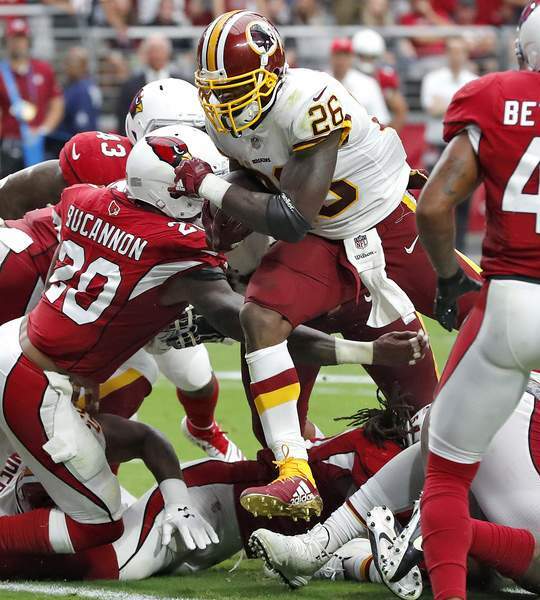 GLENDALE, Ariz. – Alex Smith carved up the Arizona defense for 255 yards and two touchdowns, Adrian Peterson rushed for 96 yards and a score and the Washington Redskins spoiled the Cardinals coaching debut of Steve Wilks with a dominant 24-6 victory on Sunday. Johnson, who signed a three-year, $39 million contract extension with Arizona on Saturday night with $30 million guaranteed, carried nine times for 37 yards and caught five passes for 30 yards. Sam Bradford, in his debut as Cardinals quarterback, was 20 of 34 for 153 yards and was intercepted once.